Inducted 2010. The Hall of Fame Boasts Plenty of Athletes who Excelled at Three Sports, but Winking Always will be Remembered as One of the First. The Hall of Fame boasts plenty of athletes who excelled at three sports, but Winking always will be remembered as one of the first. 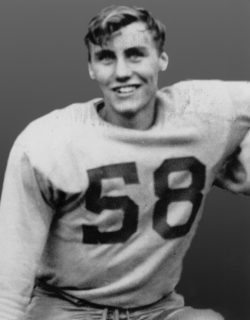 Winking, a 1951 Notre Dame graduate, played quarterback, halfback and fullback on offense and linebacker on defense for the football team. He was the leading scorer and co-captain as a senior, helping the team win the Mid West Conference trophy with a 5-0 record. He received a full scholarship to George Washington University, where he kicked off and played defensive end in 1951. He was a two-year starter on the basketball team, leading Notre Dame in scoring with 321 points as a junior and 312 points as a senior. Winking was a pitcher and outfielder for the baseball team, earning three letters. His pitching record was 17-2, and he struck out 156 batters in 129 innings over three years. He also had a .336 career batting average. After playing at George Washington, Winking played football and baseball at Carthage College. He fulfilled his military obligation from 1953-55, and after he got married and worked for Illinois Bell, he returned to Carthage College in 1957. He played baseball and football for two years. 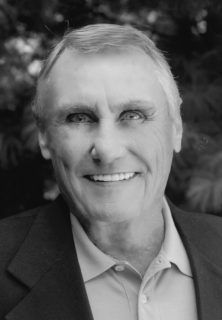 He recorded 136 tackles as co-captain of the 1958 football team and was named to the all NAIA District 20 team. He led the baseball team in hitting one season and in pitching the other season. Winking lives in Springfield. He is the father of three children — Teri Wagner, Tracey Beagle and Todd Winking. He retired from Illinois Bell Telephone Company in 1991. Thanks to the Quincy Notre Dame Hall of Fame Committee for selecting me. It goes without saying that I feel honored and humbled for being inducted. I also would like to thank all the athletes in the classes of 1948 and 1949 for helping me get started in the sports that I played. I am very grateful to my teammates for their team effort during our varsity years. When I was informed of my selection, I thought about my place in time at Notre Dame; football played at Q Stadium, basketball practiced and played at the Army Reserve Armory, baseball played at the old Quincy College field. Sometimes, we played at Q Stadium under the lights against QHS before a Quincy Gems game. This time would not be complete unless I mention Pete Affre, our coach, driving our bus to a game while all the team members sang the ND fight song. Before and after 1951, I have seen Quincy Notre Dame produce excellent teams and athletes in all sports. The startup and growth of our great young ladies teams was a welcome addition to our school’s heritage.